Green Smart Technical Offers Professional Rope Access cleaning Service in UAE which include façade cleaning, glass cleaning, Pressure washing, Patio cleaning, Mechanical work, civil work and more. Our Services provide convenient, reliable, effective cleaning services to all our clients and helped them to keep their building exterior clean. We have scores of clients in Dubai, Abu Dhabi & cities of UAE, who are satisfied by our Services. Apart from Contract base Cleaning & maintenance services, we have been awarded Annual Maintenance as well as cleaning services from our Valuable Clients across UAE. Recently we have been awarded Annual Contract for the Al Qasba heritage site from our prestigious Client Sharjah Investment and Development Authority. Through our expert technicians who are well experienced to undertake maintenance and Cleaning efficiently and safely, we are offering as the scope of work a reliable affordable rope access cleaning and maintenance services at this prime Al Qasba Location, with our latest technique and systematic professional approach. Al Qasba a prime area in UAE which accommodates retail outlets, restaurants and Commercial office building along with a prayer mosque. 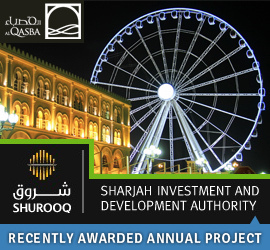 Al Qasba’s Attraction: Ferris Wheel is the majestic Eye of the United emirates, A renowned landmark in Al Qasba. You can have spectacular view of Dubai’s Beauty including landmark building, golf cost stretch, from the top of 60 meter high Ferris Wheel.